Thinking of having your child’s party at home but concerned about having lots of small children in your home at once? How about having your party at our place instead? 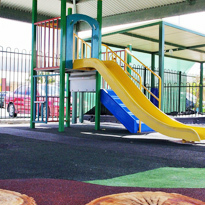 We have a large backyard with play equipment, swings and sandpits. The yard is fully fenced so there is no escapees! You can relax knowing that all your little charges are safe in our centre, and that your home is safe from young children running around in it. 15 Plastic cups, bowls and plates. Plenty of tables and chairs for children and adults. Bring along loads of enthusiam and HAVE FUN! All for $100 inc GST for 3 hours! Includes 30mins for setting up and 30mins cleaning up, leaving 2 hours of party time. $50 refundable deposit payable when keys are picked up. Drop in and see our venue during office hours (Monday – Friday 9am til 1pm). One of our team members can discuss your needs and ideas. Contact our office, via phone or email to confirm if the party room is available. Make payment via cash (at our office) or direct deposit. Once the form and full payment of the booking is received, your booking is confirmed. Collect the keys the week before your booking at our office, and provide the $50 cash bond. Return keys to our office the week following the party and collect your bond money. Our Activity Room is big enough for all types of party games! Or why not bring your own Clown, Magician, Fairy or other entertainer to fasincate the children!